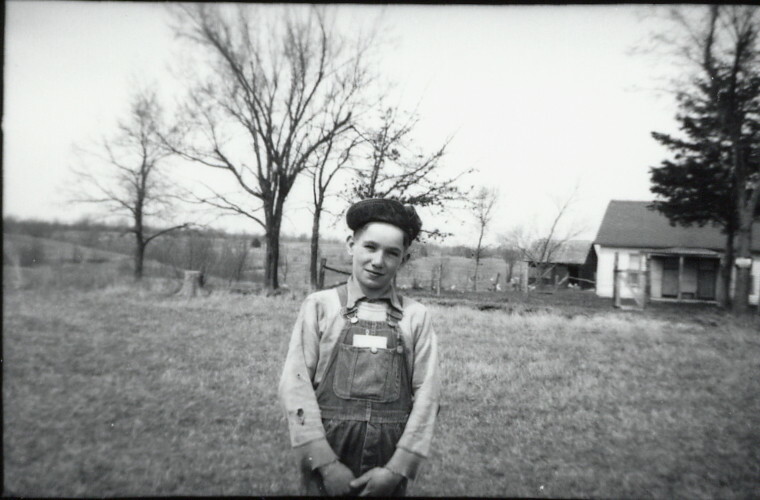 Jimmy Rufener, after graduating eighth grade at the end of the 1951 term, Manley and Ethel Graves' house in the background. We were hoping to include some personal remembrances from Miss Ratliff, until we learned of her passing in 2018. 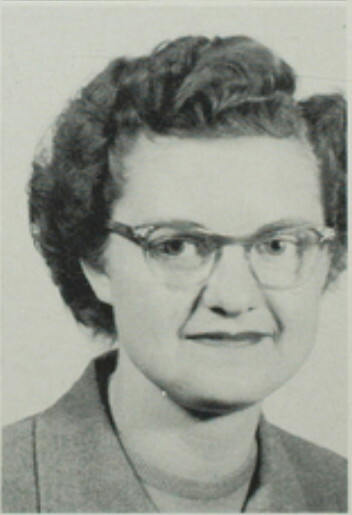 She was one of two teachers to return for a second year during the time the Trachta children went to Bohannon. Perhaps someone can provide some additional memories of her tenure at Bohannon, or of the rest of her teaching career. 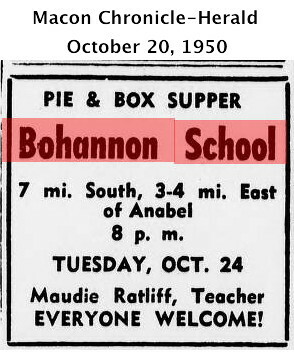 Maudie Ratliff continued the tradition of Box Suppers at Bohannon, a fund raising event that usually included a play or stage presentation put on by the students. Jimmy Rufener graduated from Bohannon School in 1951, and attended at least two years at Macon High School. At some point he went into the Army and attained the rank of Sergeant. He passed away in 1997, and is buried in the Hargar's Grove Cemetery, north of Clarence, Missouri. Jack Butkovich went to Bohannon only a short time, and no clear memories or records of him have been found. He might have been temporarily staying with a family that had recently moved into the old Miles place, about half a mile east of the school. He might have been the same Jack Butkovich living with his widowed mother in Independence, Missouri, in 1959, and perhaps the same that passed away in Kansas City, Missouri, in 1989. Perhaps someone can provide better information. The picture below was probably taken in the spring of 1951, possibly on the last day of school, but it looks a little cold for April. 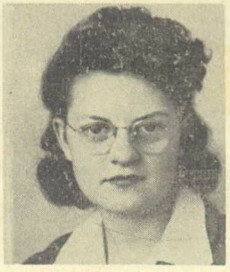 The identification of some students is speculative, but some are certain. 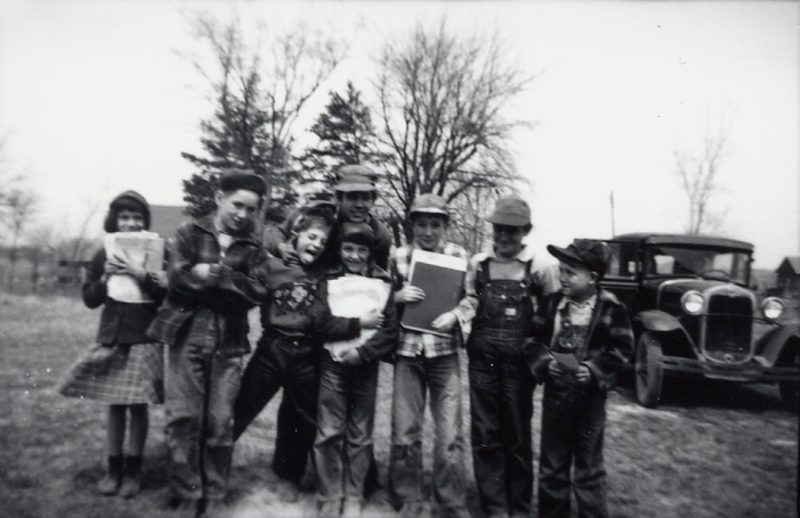 From left to right, as best can be remembered, possibly Lilly Mae Rufener, Jimmy Rufener, Gregory Trachta, Billy Hoffman (in front), Victor (last name unknown, in back), Latrelle Walker, perhaps Jack Butkovich, Wendel Rufener. Victor and Jack may have lived together, with Victor's parents, in the old Miles place between the school and the Rufener place. 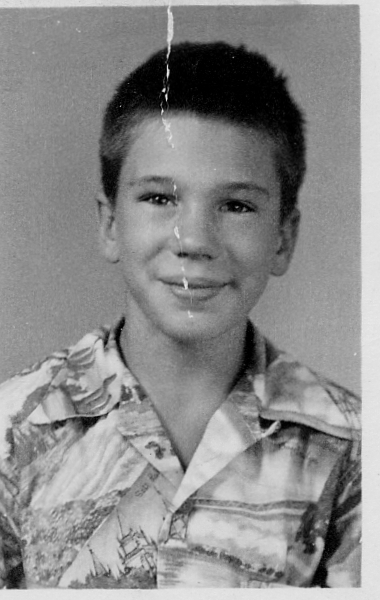 Another boy named Glen may also have lived there. It's not now certain how they were all related. The car on the right might have belonged to Owen Walker, or perhaps Everett Phillips, but its identity is speculative. The setting is outside the school house, looking north, with the Manley Graves house in the background. The picture was taken by Melton Trachta, on his Brownie 127 he got for selling Mark Twain seeds. My brother Mel, always the entrepreneur, wrote away and became a salesman of Mark Twain seeds. He was very successful, and before long had compiled enough credits to get a premium: his first camera. It was a Brownie 127, still in operation today if there were anyplace to get the film developed. It took surprisingly sharp pictures and survived a few mishaps. Once it was briefly in a Colorado lake, and logged lots of miles as the family went to Colorado and New Mexico. 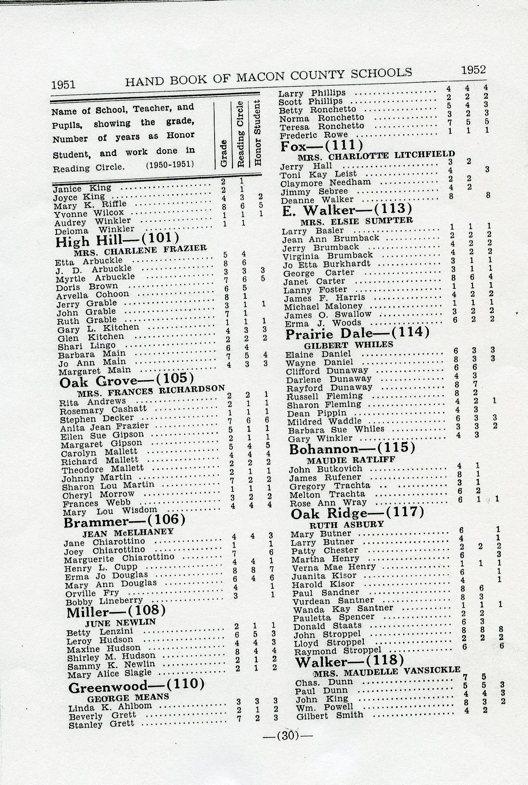 Thankfully, among his targets, were his Bohannon classmates, and we have these wonderful images. I tried my hand at working for Mr. Twain, also. It looked so easy. As I've proved over and over again, the things other people do are so much easier than when I try them. There were a number of evening entertainments during Miss Ratliff's tenure, events that included parties and refreshements, and sometimes songs and stage productions. One of these featured a scavenger hunt, and, due to over-selling by my brother and I, one of the scavenger items was a trip to the Trachta "Cave." Mel had discovered the cave early-on in our explorations of the old Bohannon place. It was a territory rich for discovery. There were at least three former house sites, which offered artifacts of living, like fragments of dishes, boards with nails in them, a usable paring knife, and farm-equipment parts. In a deep draw, between a couple of hilltops, wild water had eroded a space beneath the roots of a large tree. That was our cave. Mel had read everything written by Mark Twain, at least once. We'd been through Mark Twain's cave, in Hannibal, and the idea of a cave on our property loosed a whirlwind of fantasy. We naturally suggested including it as a destination for Miss Ratliff's scavenger hunt. She agreed, for some reason. I believe Mel and I were the only ones who made it to the cave. There might have been one or two with us. It was dark, wet, and spooky, and for the first time I wondered what creatures might be living in that cave. We stayed long enough to say we'd been there, and went back, the only ones who completed the journey. It was about this time the Rurual Electrification Administration (REA) ran lines into the neighborhood and the kerosene lamps in the school, and most homes were replaced. Some people even wired their barns, an extravagance the Trachtas never embraced, although we had a "pole light" outside and Dad wired his shop so he could use his electric arc welder. After Dad wired the house we plugged in the electric lamps, toaster, and washing machine we'd moved from California. Plumbing was another matter. Only one family that I knew of had running water: Rayel Long and his wife near Anabel. At some point a water fountain was purchased for the school. It required someone to fill the resevoir from the well outside, and to empty what the students called the "slobber bucket."